Managing input from multiple MIDI controllers used to be a daunting task. Staying on top of all the cabling, routing and software settings was enough to make you revert to entering notes with the mouse. New features in SONAR make this a snap. This tech tip will walk you through common multi-controller scenarios. Our new system for handling MIDI input signals allows you to choose an individual MIDI input port and channel for each of your MIDI tracks. This means you can now use several different MIDI controllers simultaneously, each triggering its own synth or controller parameters. Or you can choose to trigger several different synths, each on its own track, with just one MIDI controller. When you use SONAR 3 the input ports on your MIDI interface are just as powerful and flexible as the output ports. Let's take a look at using these new features. Suppose you want to record a MIDI performance. You have a keyboard controller and a drum pad controller, both connected to your computer via USB. 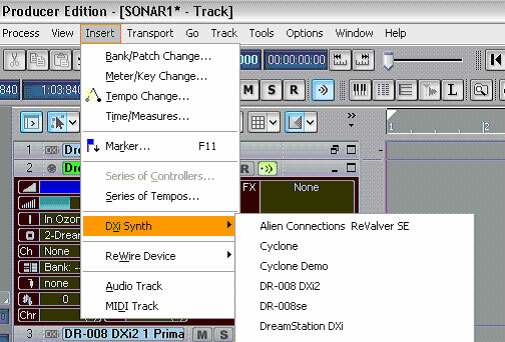 Inside SONAR you start with a blank project and insert two soft synths. 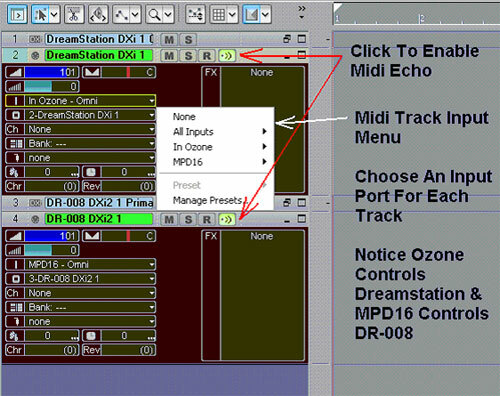 Click the insert pull-down menu and select DXi synth. For this example you might want to use a virtual analog soft synth for the keyboard controller and a drum synth for the pad-style controller. After your soft synths are inserted all you need to do is choose the necessary input source for each track and engage MIDI echo. With SONAR you now have the ability to assign a particular MIDI input port to each track in addition to a specific channel. This way you can now use each controller simultaneously to trigger both soft synths in real-time. The feeling is nearly identical to using hardware sound modules. In addition to playing multiple soft synths you can record to multiple MIDI tracks at the same time. This affords you all the same convenience as multi-track audio recording. Imagine the possibilities when you add other artists to the situation, each with their own controller and assigned soft synth. After the session is over you can continue to rearrange and edit the performance in ways only MIDI and soft synths provide. As mentioned earlier, you can also use the advanced MIDI routing in SONAR 3 to trigger several soft synths with just one controller. The setup process is just as easy as the previous example. Simply insert a few soft synths into a blank project. Enable MIDI echo for each MIDI track. This time instead of assigning a different input port to each synth choose the same input port. Now the controller connected to that port would trigger all of those synths at the same time. This way you can create huge synth layers containing any kind of synthesis technology available today. The combination of the advanced MIDI routing in SONAR with software synthesizers brings an incredible advantage to your productions. You can easily save any complex synth layer setup because everything is integrated into your project file. Any multiple MIDI controller performances you capture in SONAR 3 can be saved and recalled for additional sessions down the road. If you happen to have any favorite hardware sequencers, try incorporating those into your multi-controller setup as well.